Planting the more formal flower-beds with half-tender and half-hardy bedding plants will be the principal work out of doors this month. The earlier a stock of plants can be ready the better, as this is a very crowded time in the greenhouse, and it is well if bedding stuff can be early removed to frames, and later on stood in the open. By this method strong plants will be ready, and space indoors economised. 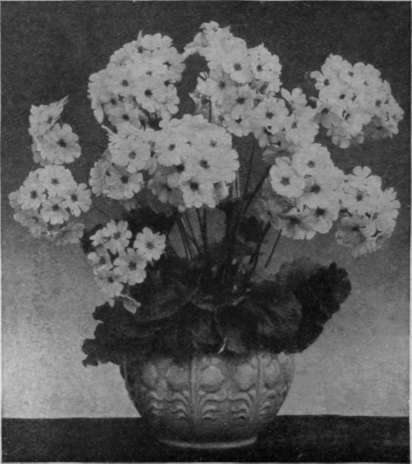 In addition to the more conventional bedding plants, such as geraniums, fuchsias, lobelia, etc., more use might be made of hardy annuals raised early under glass, among which may be mentioned mallows, godetia, clarkia, coreopsis; and, among dwarf plants, limnanthes, collinsia, lepto-siphon, and alyssum Snow Carpet. These may be planted out quite early, but the less hardy bedding plants should not be put out before the middle of the month in sheltered places, and towards the end in colder situations. Spring bulbs must not be removed from the ground until their foliage is withered if it is intended to store them. If the beds are required for summer plants, the bulbs may be lifted carefully, and laid in reserve beds until the foliage is withered, or else be used for naturalising. Gladiolus corms may still be planted out, and dahlias should be put out this month in deeply cultivated ground. Harden off the foliage of cannas by standing them in full sunshine during the day. Early - flowering chrysanthemums should be put out in their summer quarters. Plant about 18 inches asunder in a sunny position, and pinch back the shoots once or twice to induce a bushy growth. The plants should be well watered if dry weather follows the time of planting out. Seeds of sweet peas and other annuals may be sown out of doors for a succession. Thin out spring-sown annuals as required, stake sweet peas and other plants directly this becomes needful. Some stimulant may be given to border plants in rapid growth. Transplant seedling hollyhocks raised by autumn sowing. Double daisies can be planted in shady borders, and primroses divided and planted out in moist shade. A keen watch must be kept for greenfly on roses this month, as cold winds are sure to encourage it. Syringe the trees vigorously with emulsion or tobacco-water, as if the pest is allowed much hold, growth will be stunted and the flowers spoiled. Maggots should be destroyed by hand-picking. Standard roses should be staked, and liquid manure may be given once a week with advantage to roses in beds in the grass. Shrubs which flower on the new wood should be pruned directly after blooming, thinning the wood well out. Forsythia, lilacs, flowering currant, and mock orange are among shrubs to be treated in this way. 100m for expanding shoots. Never allow climbers to become entangled when they begin to be in need of training. Grass will need cutting constantly, and lawns and paths should be weeded, rolled, and kept smart. Plants should be syringed freely in the evening to keep down pests. Thin out all superfluous growth, and keep climbers cleaned and trained. Repotting of plants which require more root-room may be done this month. Aspidistras can be propagated, putting the divisions into rather light, well-drained soil. All palms and foliage plants should be kept well cleansed and nourished. Well-rooted fuchsias may be potted on, but if a few early plants are wished for, these may be fed judiciously instead of being shifted. To secure good specimens, the tips of shoots may be pinched out. Harden off bedding plants gradually. Sow seeds of cineraria, auricula and primula, and of giant and Brompton stocks. Plants of auriculas which have finished flowering may be potted up in rich, well-drained compost, and set on the greenhouse staging, facing east. Keep a moist atmosphere and give plenty of water, especially to basket plants. The latter should be syringed frequently, or dipped in a tub from time to time. Ferns will have to be shaded. Shift on plants which require it, and put in cuttings where-ever more stock is required. The night temperature should not fall much below 700 this month. Plants may be retarded in a house which faces north. Many plants in the forcing pit will require potting on, and young stock should be pinched where needful and kept near the glass. Keep a night temperature of 650. Make fresh sowings of peas, and stake those which are now in need of it. Broad beans may be sown for a late crop, and French and scarlet runner beans sown in the open this month, planting out any which have been raised in boxes. Make a fortnightly sowing of French breakfast radishes. Thin out lettuce seedlings, and sow for a fresh crop. Tie up any heads which are ready for blanching. Sow chicory and endive at the end of the month. Mustard and cress may be sown weekly in moist ground. Thin onions to six inches apart, using the thinnings in salad, and dust the plants with soot from time to time. Leeks may be planted out in shallow trenches when six inches high. Thin out beetroot to nine inches apart, and sow again in the middle of the month. Parsley should be thinned to six inches to make fine heads. In cutting asparagus, be careful not to strip the plants too much. Seeds of vegetable marrow may now be sown in made-up beds of rich soil and manure. Young plants of Brussels sprouts should now be put out two to three feet apart. Plant cabbages and colewort, choosing showery weather, if possible. More trenches must be prepared for celery, if required. Lettuces may be planted on the ridges as a " catch " crop. Seedlings of celeriac can be planted out. Carrots may be sown for a winter crop. Prick out April-sown broccoli six inches apart for June planting, and plant out autumn cauliflowers at the end of the month. Early potatoes may need earthing up. All vegetable crops should be assisted by constant hoeing, to keep weeds down and promote a coo!, moist condition and healthy growth. Ward off attacks of insect pests on apples, pears, plums, and other fruit trees, spraying the trees constantly. It may be necessary to pinch out the points of plums in order to con-centrate the strength below, and all unnecessary shoots should be stopped in good time. If cherries are attacked by slug-worm, hand-picking is the best remedy. Shorten the shoots when nine inches long.